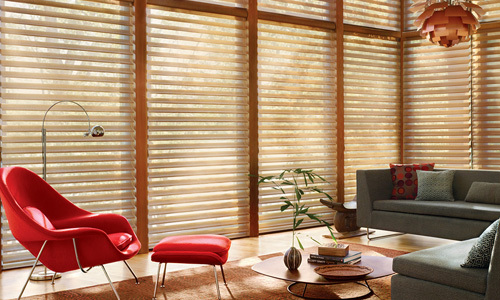 Silhouette® window shadings from Hunter Douglas transform sunlight into remarkable beauty. Available in a wide range of beautiful fabrics, including casual linen, woven and light dimming materials. 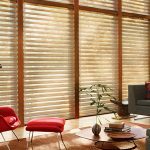 Hunter Douglas created a whole new category of window fashions when launching Silhouette® window shadings with the signature S-vane. 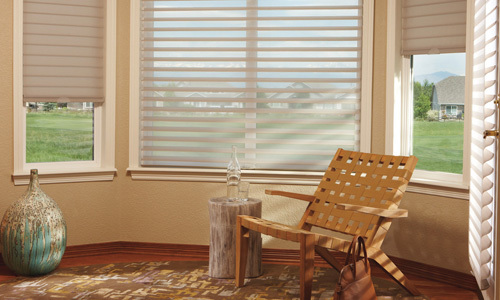 Light control and privacy – Silhouette window shadings assure privacy and manage light beautifully. Vanes simply tilt to the precise angle to let in the perfect amount of desired light. Save Energy – Nature lights any room! Daylighting efficiency is maximized by diffusing and dispersing sunlight throughout the room, which enables lights to be turned off and energy to be conserved. 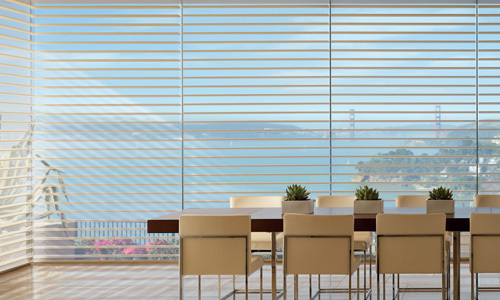 UV protection – Silhouette window shadings provide unparalleled protection without compromising views. Customers will enjoy up to 88% ultraviolet protection with vanes open and 99% with vanes closed. Interior furnishings are shielded from direct sunlight preserving their beautiful qualities. 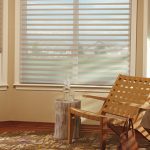 Style is of utmost importance – There are no cords or tapes to distract from the elegant appearance Silhouette shadings provide. 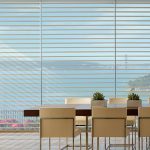 Dramatic View-Through – Silhouette has a patented sheer facings provide an uncluttered view to the outside. Mood setting – A unique ambiance is created when light is converted through the three fabric opacities Silhouette shadings offer; semi-sheer, translucent or light-dimming vanes. 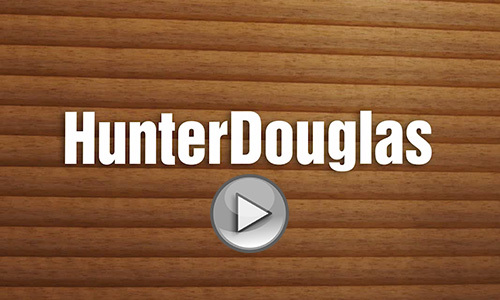 Quality – Hunter Douglas window shadings have the highest quality standards on the market.